Iran appears to have dramatically slowed work on its atomic energy program since the summer, U.N. officials said Thursday. The report could add momentum to diplomatic efforts to resolve a decade-old dispute over Iranian nuclear activities. The report by the International Atomic Energy Agency said Iran all but halted the installation of new centrifuges at its uranium enrichment plants beginning in August, the same month that moderate cleric Hassan Rouhani was sworn in as president. Work on a controversial nuclear reactor also slowed, the U.N. watchdog agency said. Iran continued producing low-enriched uranium, but at a slightly reduced rate, it said. President Obama made a vigorous appeal to Congress on Thursday to give breathing space to his efforts to forge a nuclear deal with Iran, and the prospects for an interim agreement may have improved with the release of a report by international inspectors who said that for the first time in years, they saw evidence that the Iranians have put the brakes on their nuclear expansion. The inspectors, from the International Atomic Energy Agency, said that very few new advanced centrifuges had been installed since President Hassan Rouhani of Iran took office in June, promising a new start with the West, and that little significant progress has been made on the construction of a new nuclear reactor, which became a point of contention in negotiations in Geneva last week. Note that one of the big pieces of news heralded by the Post and the Times is the halting of installation of new centrifuges. But buried in the back of the report (pdf), in the second annex, is a graph showing the total number of centrifuges installed, the number of centrifuges dedicated to enrichment of uranium up to 5% and the number of centrifuges dedicated to enrichment to 20%. I have reproduced that graph here, but I have added arrows pointing to two major discontinuities in the trends shown in the graph. The early arrow, where we see a halt of nearly two years in the installation of new centrifuges and a loss of a number of centrifuges enriching to 5%, corresponds very closely to the release of the Stuxnet worm in early 2010 (although it looks like the loss of functioning centrifuges may have been in late 2009, so the actual release most likely was around that time). IAEA graph of Iran centrifuge operation over time. I have added arrows for the release of the Stuxnet worm and imposition of stronger sanctions. 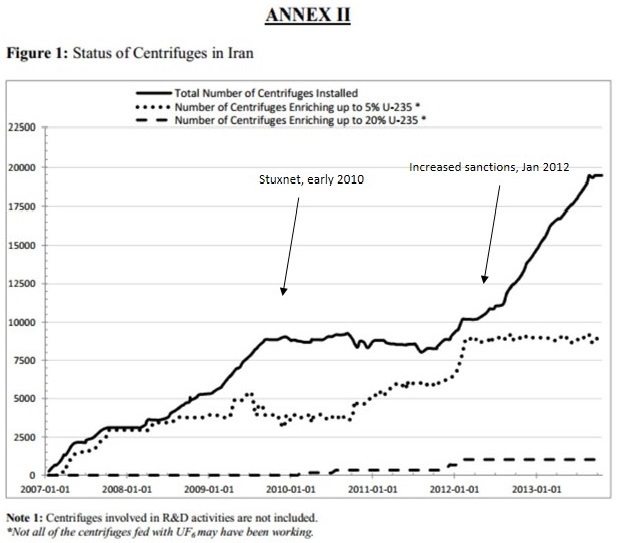 Beginning in early 2011, Iran put more of its installed centrifuges into operation for enrichment to 5% and continued at a fairly steady pace throughout much of the year. At the beginning of 2012, the US and EU imposed much stronger sanctions on Iran. Although Iran did put some centrifuges into operation for enrichment to 20% around that same time, this graph shows that even though Iran restarted installation of new centrifuges in 2012, no additional centrifuges have been put into service for enrichment to either 5% or 20% since early 2012. This capping of enrichment capacity that is in actual operation has rarely, if ever, been noted in the press. Significantly, it predates Rouhani’s election by over a year. Perhaps it is a sign that the sanctions were effective in getting Iran to put the brakes on their program. Alternatively, it might suggest that Iran knew where Israel’s “red line” would be (a stockpile of around 200 kg of 20% enriched uranium might be enough to make a bomb after further enrichment) and made sure that the approach to this line would be slow. They also delayed its onset by converting some of the 20% enriched uranium to fuel plates so that it would be less readily subjected to further enrichment under a “breakout” scenario. The halting of new centrifuge installation shows up in the graph, where we see the installed centrifuge line level off in the middle of this year, but this seems less dramatic than stopping the process of putting installed centrifuges into use for enrichment. When we realize that significant steps were taken to slow advancement of Iran’s nuclear program before Rouhani was elected, it becomes easier to understand why his “moderate” stance and willingness to enter into negotiations have not met with significant resistance from Iran’s Supreme Leader Ali Kahmenei and other leading clerics. Does Obama have the balls to tell Bibi to go frak himself so we can work out a deal with the Iranians? There is one fact that I think the American press seems to ignore in their analysis: The Iranian President does not control the nuclear program. It is run via the Revolutionary Guards with direct control of the Supreme Leader who is, by the way, getting old and trying to pave the way for his son to succeed him. As such the willingness of the NYT to base most of their assumptions about the policy on the Rohani or Ajmedenejad’s behavior has always been a bit off base. @GulfCoastPirate: While I doubt the Supreme Leader and others are changing this policy based upon the sole fact that discussions with the U.S. piss off both Tel Aviv and Riad I bet they do see it as icing on the cake. And seriously what self-respecting world leader would use Twitter to sandbag negotiations. That Joby Warrick, he’s quite the jokester. From the beginning of Iran’s nuclear talks with the U.S. and Europe, the country has managed to win delays and move their weapons program closer to the point of breakout. A deal that does not fully remove Iran’s capability, including its 18,000 centrifuges; to produce a nuclear weapon will endanger U.S security. The object lesson here is North Korea. It has strung the West along for decades, negotiating, offering, agreeing, only to then backtrack and restart. It merely bought time to resume its nuclear weapons ambitions. Iran does not have a weapons program, according to US intelligence, and has expressed no nuclear weapons ambitions. It has strung the West along for decades, negotiating, offering, agreeing, only to then backtrack and restart. It merely bought time to resume its nuclear weapons ambitions. You are familiar with the Israeli method to steal the rest of Palestinian lands using the farcical negotiations process?